misc/fun freeware downloads for Windows Mobile Phone. Pocket PC Themes let you personalize appearance of pages Tod. Ghost Rider Pocket PC theme featuring Nicolas Cage. . Original Media Player user interface is impossible to contro. This is a collection of 20 stunningly beautiful Christmas th. 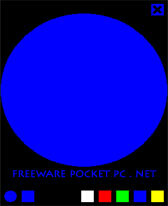 Eragon movie Pocket PC theme featuring Sienna Guillory. .
Summary: pLamp is an application which emulates a flashlight. Change the color by tapping on the color switch at the bottom of the screen, tap the X button at the top of the screen to exit.